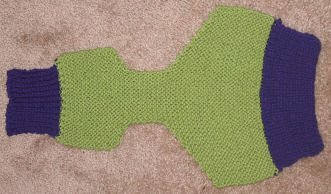 I dreamed of knitting soakers all night after finishing up late late last night, er, this morning. Anyway, when I finally dragged myself out of bed this morning, I went straight to knitting (around making blueberry pancakes for the natives) and have finally cast off the front waistband (a little floppy for my liking so I'll probably try another "stretchy" bind off next time). Now just need to knit the legs and sew everything up and I'll be done. All in all, it's been a pretty fast project. Wow, Trudi! Awesome job! I can't even imagine the knitting-mango-under-the-neck relay. We're going to need pictures of that, I think. I love your colors! Trudi! These are great! You are one talented woman. What fun the relay must have been. Thank you, I'll have to see what I can do about getting a pic of the relay. Guess I should have said "Mango-under-the-chin," would have been much more apropos. It was a spin off the old Grapefruit under the chin relay where you have to pass the grapefruit from one person to the next from neck to neck without using your hands. This one we didn't pass the mango, but had to run to the end of the line to the next person with it under our chins.